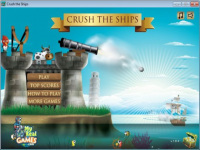 The Game Crush the Ships is about defeating entire enemy ships approaching to your kingdom. Their goal is to destroy your kingdom. Therefore choose an appropriate number of weapons available to destroy those ship fleets until there is nothing left. Weapon selection gives different result to gain victory. Weapons can be purchased using gold points obtained after winning each level. The faster you defeat the whole attackers, the more gold you will get, and surely the more weapons you can buy for the next level of battle.